Join Us for Co-op Week Celebrations! Stop by CCEC on 2248 Commercial Drive from 10am-12pm where we’ll be helping flip flapjacks in honour of International Credit Union Day – come on by to have your fill! The BCCA will be hosting a special evening co-op cafe as a part of the Co-op Week celebrations. Come to Red Truck Brewery from 5:30-8:30 pm for a beer while connecting with local co-operators and getting your burning co-op questions/ideas discussed. Please RSVP with our Community Administrator, Maggie Miland. 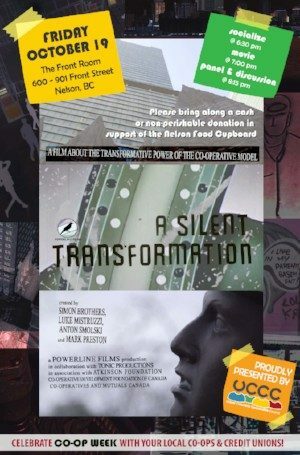 The Upper Columbia Cooperative Council will be screening A Silent Transformation as a part of Co-op Week! This film about the transformative power of the co-op model will be shown Oct. 19 in Nelson at The Front Room 600-901 Front St.
Come for some socializing at 6:30 pm with the movie starting at 7 pm, followed by a panel discussion. These events are a great opportunity to connect with co-operators in a series of fun, casual settings, while also supporting your local co-op and credit union sector. We hope you can join in the festivities and be sure to check out what other Co-op Week events are happening in your area!